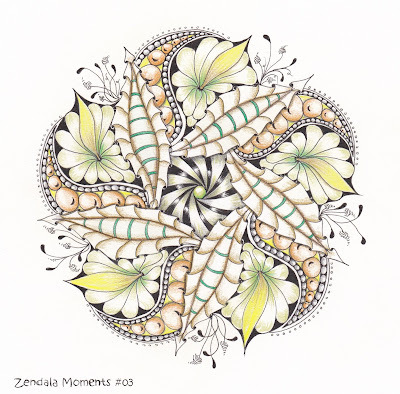 For the Zendala Moments #3 here's my contribution. I drew with a black Micron 01 and colored with colored pencils. Thank You Annete for this beautiful template! WOE - Spring is here - love it!!! Very lovely. I wish Spring was here where I live (we still have snow). What a lovely delicate Zendala. Great interpretation of the template. This is really beautiful, Mariet. There's a distinct sense of movement in this. So beautiful and spring like! Wonderful and very elegant zendala! Really spring like! So lovely colours! I love it! Zoals iedereen al zegt, mooie lente zendala. Ik vind de kleuren ook goed gekozen.